This adorable couple met in college. And no, they were not the typical college sweethearts. As a matter of fact, their first meeting wasn’t the best meet and greet. It was when at that time, they had their own things going on in college; but as they say, you land up meeting the most important person in your life when you least expect. A year or two passed by, they were both paving a path for their careers, and Jithin was getting ready for his masters in USA. Three months passed by and he lost his brother, Justin. Evelyn was there, when he was facing the darkest phase in his life. She was that pillar that he had to lean on and helped him overcome his loss, building good memories of his late brother. Their beautiful wedding held in St. George Syro-Malabar Catholic Church, New York blew us away with its classic elegance. The timeless white gown and 3-piece suit that the couple wore has a quaint beauty that would always be 'in'. Look out for the soft pink, gold and white pinterest-worthy decor at the reception as well as the pretty floral headbands worn by the girls! Captured brilliantly by Anoop Padalkar. 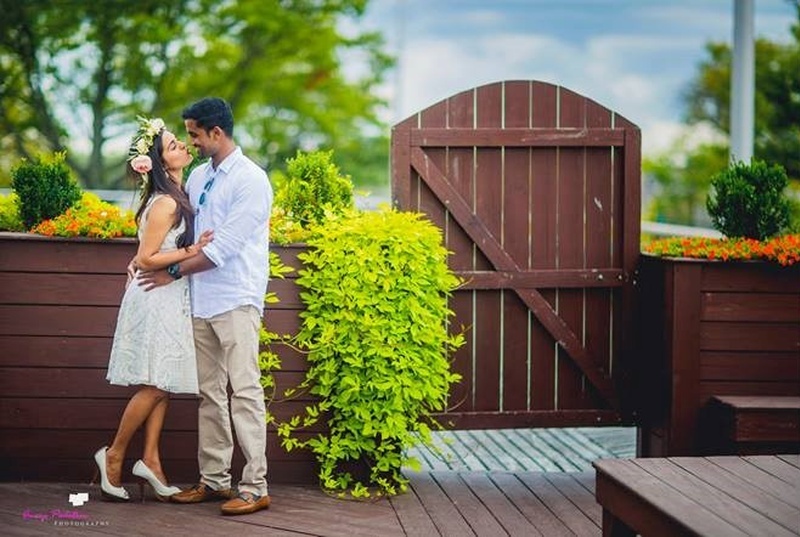 The wedding that took place at St. George Syro-Malabar Catholic Church, New York was an elegant, classy affair with a lot smiles and a lot of love. Evelyn graced the occasion in a timeless mermaid-silhouetted, semi off-shoulder white gown with floral lace and a sweetheart neckline. The layers of fabric at the train added a lovely effect. She accessorized with a single-strand white necklace that was simple and sophisticated. The make-up was of minimal pink tones. Jithin looked quite handsome in a deep blue 3-piece suit that was the epitome of classy trendiness. The details were in the black lapels, soft pink bow-tie and the white boutonniere. The bridesmaids looked as pretty as ever in one-shoulder baby pink dresses with satin waistline sashes that went along perfectly with the wedding theme. Their bouquets of light pink flowers with pops of deep pink and orange enhanced the attractiveness of it all. One thing that didn’t change throughout the ceremony was the wide smiles on the couple’s faces. The décor at Evelyn and Jithin’s wedding reception at The Vanderbilt, South Beach, New York was beyond beautiful. Everything was perfectly laid out, with not a thing out of place. Soft pink and subtle gold hues dominated the pretty ambience. Centrepieces consisted of varying floral arrangements. The pristine white theme of the cake with pink florals to adorn is what we loved the most. The cake topper with the couple’s initials added a cute touch to it. Just like everything else at the wedding, the wedding cake was a vision of simple elegance and soft beauty. The wedding shoot had a light, fun and happy air about it. The couple had changed into casual outfits for the photo session. Evelyn looked pretty in a white fit-and-flare summery lace dress which she paired with matching white heels and a floral headband. Her better half looked just as good in a casual white shirt, neutral trousers and classy brown loafers. We loved the casual and cheerful vibe that all the pictures had in common.